Jerry Thomas. How to Mix Drinks; or, The Bon-Vivant's Companion, 1862. Take the yellow of sixteen eggs and twelve table-spoonfuls of pulverized loaf sugar, and beat them to the consistency of cream; to this add two-third of a nutmeg grated, and beat well together; then mix in half a pint of good brandy or Jamaica rum, and two wine-glasses of Madeira wine. Have ready the white of the eggs, beaten to a stiff froth, and beat them into the above- described mixture. When this is all done, stir in six pints of good rich milk. There is no heat used. Egg Nogg made in this manner is digestible, and will not cause headache. It makes an excellent drink for debilitated persons, and a nourishing diet for consumptives. Image: William Gale & Son. 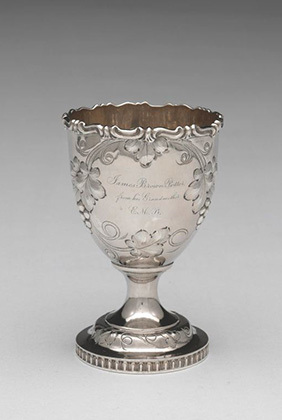 Goblet, 1852. Gift of the Antiquarian Society through the Mr. & Mrs. Thomas B. Hunter, III Fund.